The family of Kevin McDaid have accused the PSNI of being culpable in his murder by a loyalist mob. Kevin McDaid was killed for the crime of being Catholic -- but his Protestant wife Evelyn, who was also viciously attacked, has said he simply wanted peace. A call for those responsible for child abuse in institutions run by the religious orders to face criminal proceedings has been led by the President of Ireland, Mary McAleese. Prominent republican Liam Campbell was arrested in dramatic fashion in County Armagh last weekend when the PSNI police rammed his car after discovering he had crossed the border from the 26 Counties. 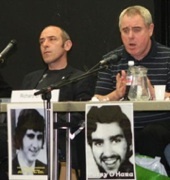 The Republican Network for Unity held an event last weekend called “What is the Truth Behind the Hunger Strike?” to examine issues which have arisen in recent years regarding the negotiations which took place in 1981. Sinn Féin launched the final stage of the party’s EU and local election campaigns on Wednesday with the unveiling of billboards, advertisements and new posters across Dublin. A list of Sinn Fein and other republican candidates in the forthcoming elections across Ireland on June 4th and 5th. The Police Ombudsman is to investigate reports that a PSNI unit stood by and watched as Catholic father-of-four Kevin McDaid was beaten to death on Sunday evening. A 49-year-old Catholic man has been killed in a loyalist rampage in Coleraine, County Derry. A press photographer was badly beaten at a unionist paramilitary funeral for a notorious mass murderer on Thursday afternoon. Blood samples on the clothing of Catholic murder victim Robert Hamill were not analysed, the inquiry into into his murder has heard. The first Irish Famine Memorial Day commemoration took place in Skibbereen in west Cork last Sunday, May 17th. Relatives of those who lost their lives in the Dublin and Monaghan bombings marked the 35th anniversary of the atrocity with a wreath-laying ceremony in Dublin this week. With local and European elections less than three weeks away, the latest poll shows satisfaction with the Dublin government has slumped to an extraordinary record low of just ten per cent. Belfast journalist Suzanne Breen and her newspaper, the Sunday Tribune, have received widespread support for their refusal to comply with demands by the PSNI police to identify journalistic sources within the ‘Real IRA’. Young Catholics are far more likely to face prosecution than Protestant youths in the North, a new equality study has revealed. The 32 County Sovereignty Movement in Derry has denied that dissident republicans were behind a petrol bomb attack on the home of Sinn Féin leadership figure Mitchel McLaughlin at the weekend. A dirty protest at Portlaoise prison is entering its sixth week, with prison warders admitting they see no signs that the ‘Real IRA’ men involved will soon end their demonstration. A former unionist paramilitary ‘brigadier’ has been fined just one pound after prosecutors agreed a deal with the defence in a Belfast courtroom over the proceeds of his crimes. The family of Catholic schoolboy Michael McIlveen have criticised the lenient sentences given to seven people convicted in connection with his savage killing. Sinn Féin’s European candidate Bairbre de Brun has emerged as the bookies’ favourite to top the poll at next month’s election but is facing a hard battle against the DUP’s Diane Dodds. The Green Party has moved to distance themselves from their Fianna Fail Coalition partners by refusing to call on their supporters to transfer their votes in the three sets of elections scheduled in hte 26 Counties for June 5th. In a landmark ruling, two men convicted in relation to IRA-related charges 30 years ago when they were teenagers have had their records cleared. 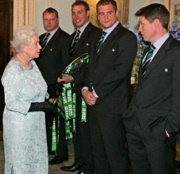 A visit by the Queen of England to Derry has been condemned by Republican Sinn Féin. The 26-County state is set to experience a depression surpassing that of any other industrialised nation for over 70 years, according to official predictions. The High Court in Belfast has ruled that a decision to withhold state funding for a UDA-related group over that organisation’s refusal to decommission its weaponry was “illegal”. Colin Duffy has been granted permission by the High Court to challenge prison service silence about any covert surveillance being used against him. 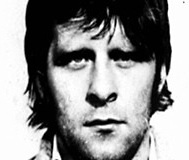 RUC Special Branch systematically failed to warn people under threat by loyalists, the Billy Wright Inquiry has heard. Four men guilty of the sectarian murder of a Catholic schoolboy have been given minimum sentences of up to 13 years in jail.